Our sweet Beatrice turned 1 this past week. Hard to believe. 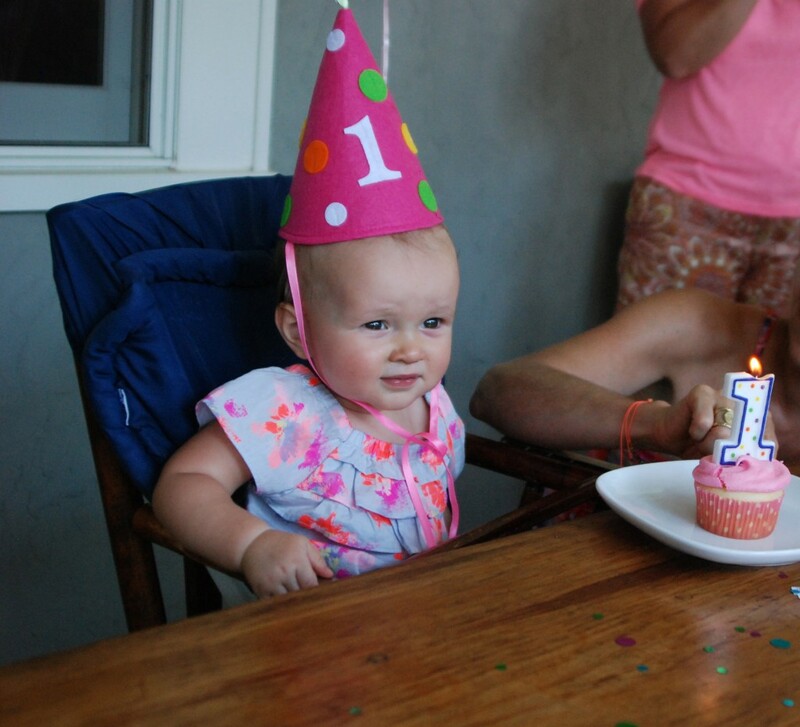 We found ourselves reliving each moment of the day she was born, as we often do on our childrens’ birthdays. After all the pink cupcakes were eaten, balloons deflated, and gifts strewn about the house, we read through the birthday wishes once again. Over the years the mantle over our kitchen fireplace has become the natural location to display cards, and they seem to stay their for awhile. I like this tradition. It seems fitting. However this year I started a new tradition. Katherine, a good friend of mine who lives in Portland, has been writing a birthday letter to her children since their early years. 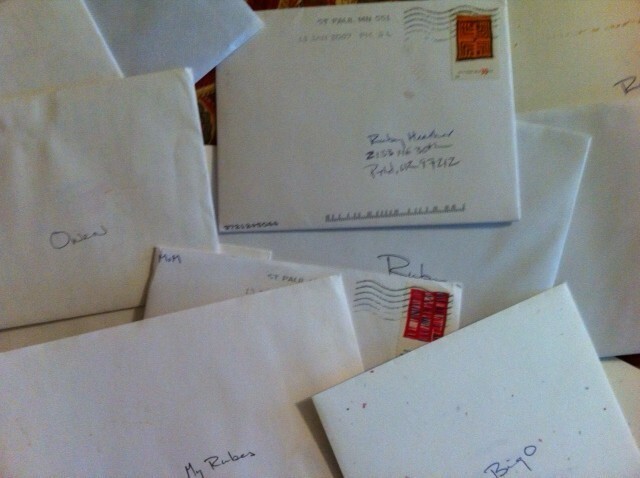 It began when a friend shared the idea of writing letters to her kids in case she passed away while they were still young. She thought, “You are nuts. I can’t write those (thoughts) without crying like mad.” But then she tried it and loved it. And now, Katherine no longer thinks about the possibility of not being around to share this information, but, instead, centers her letters towards details such as “this year you…And we did….” She also includes a photo of herself and child during that time, anecdotes, and maybe a bit of motherly advice. Katie looks at the letter like a big journal entry about her children, delivered directly to them, but not opened until years later. 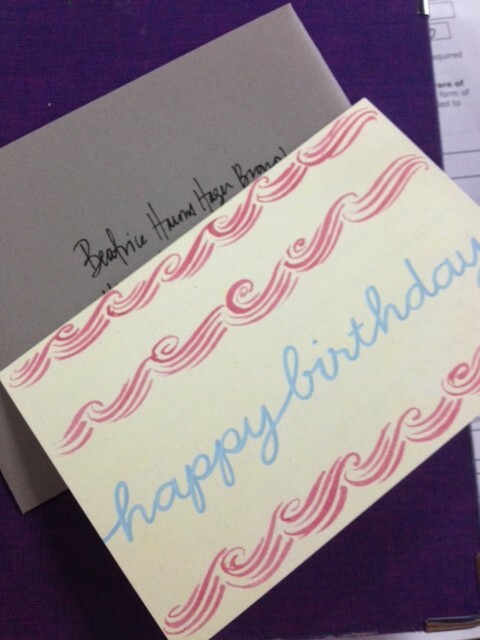 So this year, I found a Birthday card, (I have just a few in the basement waiting to be sold on Brown Ink), sat down and wrote my first “year in review” letter to Beatrice. It did feel a bit like a journal entry but was even more meaningful knowing these written words would not be read until Beasie’s an adult. Hopefully my handwriting won’t look unfamiliar to her and the stories – some she’ll know, others she won’t – will help her understand what makes her Beasie. Stop the season. 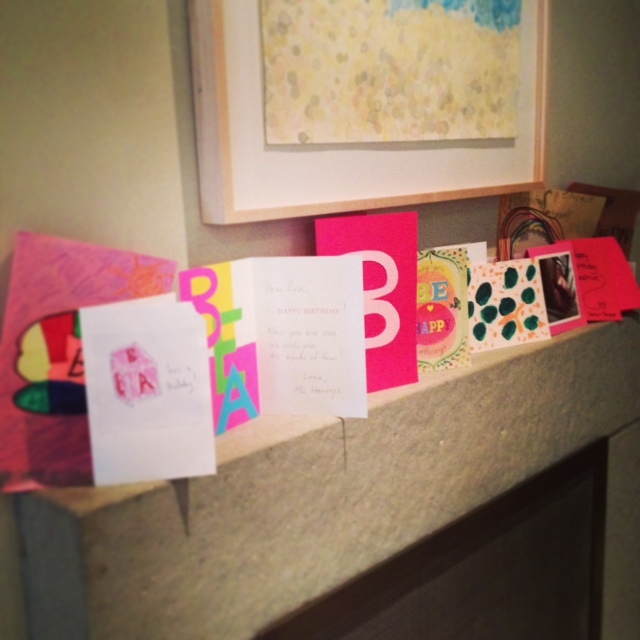 Summer is halfway over and I have yet to remind readers my love and the importance of camp letters! As I shared last year, aside from talent shows and singing in harmony around the campfire (you think I’m joking? ), nothing brought more happiness than receiving a written letter at camp. A simple reminder that someone back home is thinking of you can bring joy to any camper, especially in today’s digital world. Packing pre-addressed, pre-stamped envelopes with colorful notecards and unique stamps is probably all you need. However, if you supply a child with camp-themed stationery it might be just the trick to get them to share a wee bit more of their adventures while away from home. Anne Marie from Scout’s Honor Co created a summer theme to her recently released stationery. 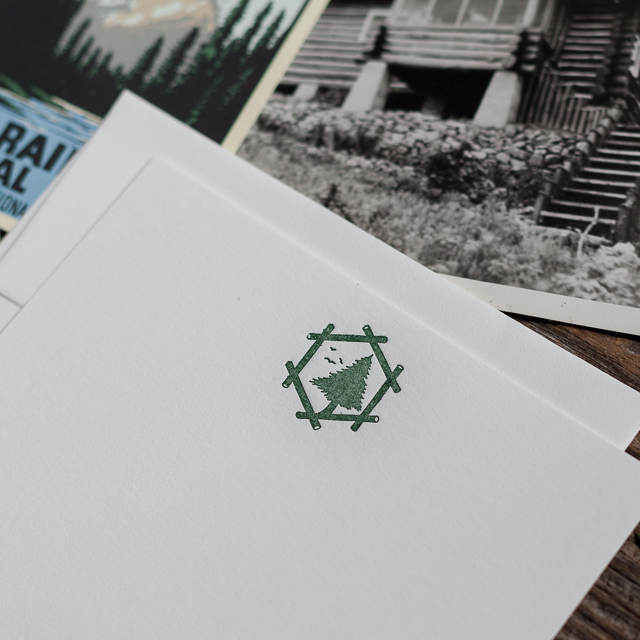 I adore the Summer Camp card set as well as the Bait + Trail set, both perfect for camp letters. 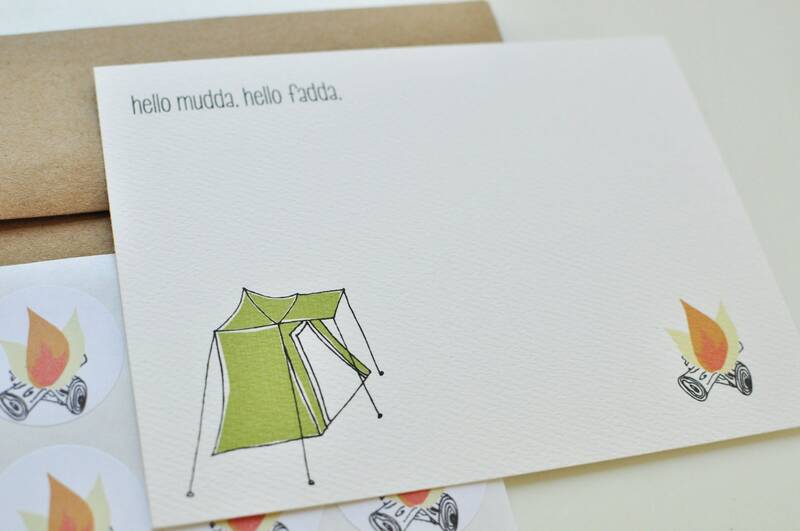 Personalize your stationery with these Campfire & Tent themed cards. 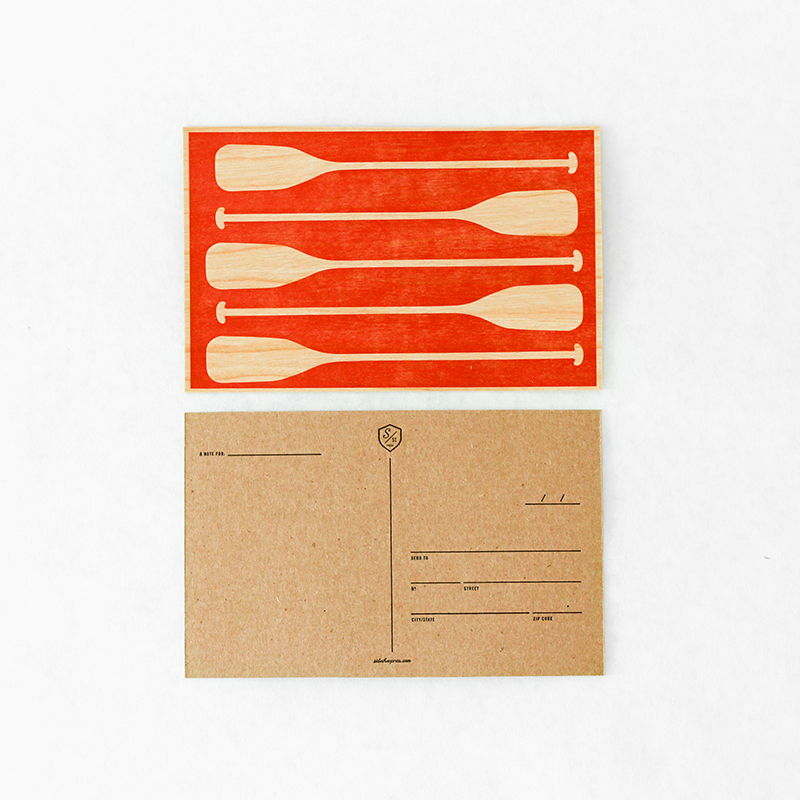 For the enthusiastic letter writer, this letterpressed camp stationery from Fawnsberg is perfect for young people to share all the details of their activities. My Camp Adventure Stationery seals the deal with a Summer Camp 2013 sticker! Sideshow Press is entirely Camp-themed (can’t wait to be selling some of their fabulous goods this fall!). 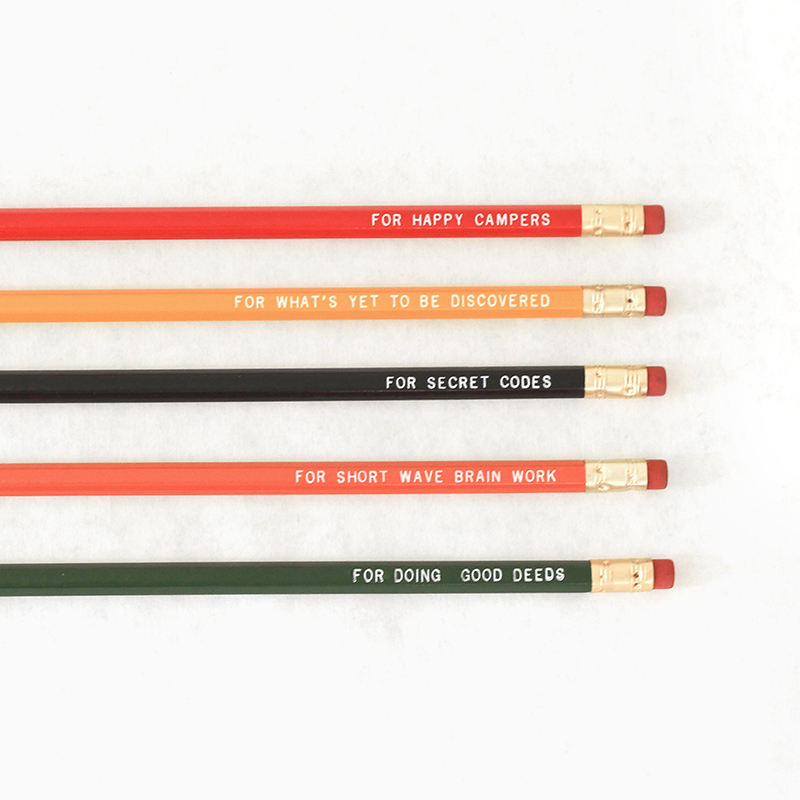 A camper would go crazy for the Canoe Pencil Case filled with Message Pencils. 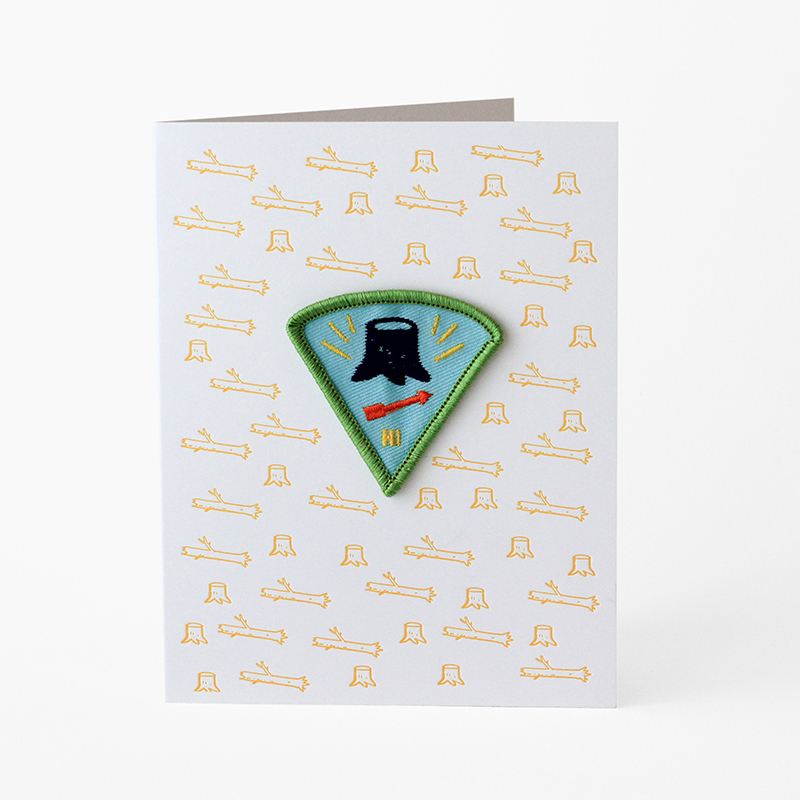 When packing their duffle don’t forget to throw this Sunshine Journal (filled with awesome craft paper), Paddle Postcards, and a Patch card with a message sharing how proud you are of your child venturing “away” camp. They can wear their badge of honor when camp is finished! Why shouldn’t learning to write letters be among one of the independence-building experiences your child brings home this year? Who knows, they might even come home with their first pen pal. On Sunday night, after four jam-packed days of family activities, my boys gave me the best surprise ever. They began an interpretive dance to Iron and Wine’s Boy with a Coin using a few new movements such as strapping the seatbelt, driving the bus, zombie walk and my favorite, the pencil sharpener. Your guess is as good as mine as to where they learned to sharpen a pencil the old-fashioned way, but nevertheless, it made my heart flutter. Their creative juices were flowing with an old school twist! I can say the same with the couple behind Epokka Idea Book Systems. 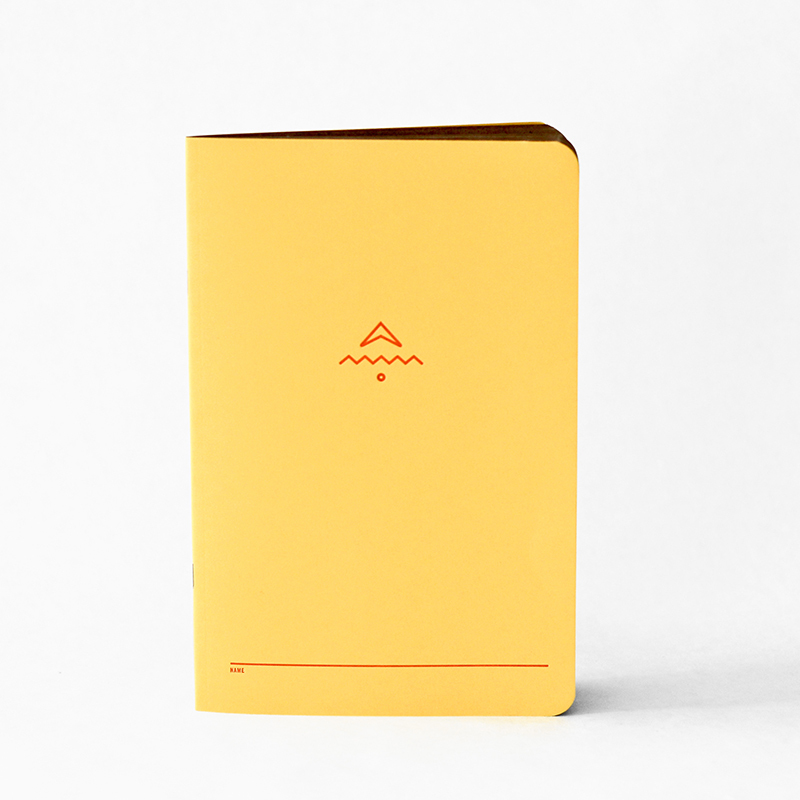 These folks have created a unique notebook system to capture it all in one place, simply inspired by creativity. Naomi and Koldo have combined their talents to create a notebook which organizes and enhances the different ideas and projects in one’s life. You’re also able to select which paper best suits your needs be it dot-grid, lined or blank sketch. Of course, all bright ideas need support so they’ve turned to Kickstarter with the hope of raising the money they need to go forward. 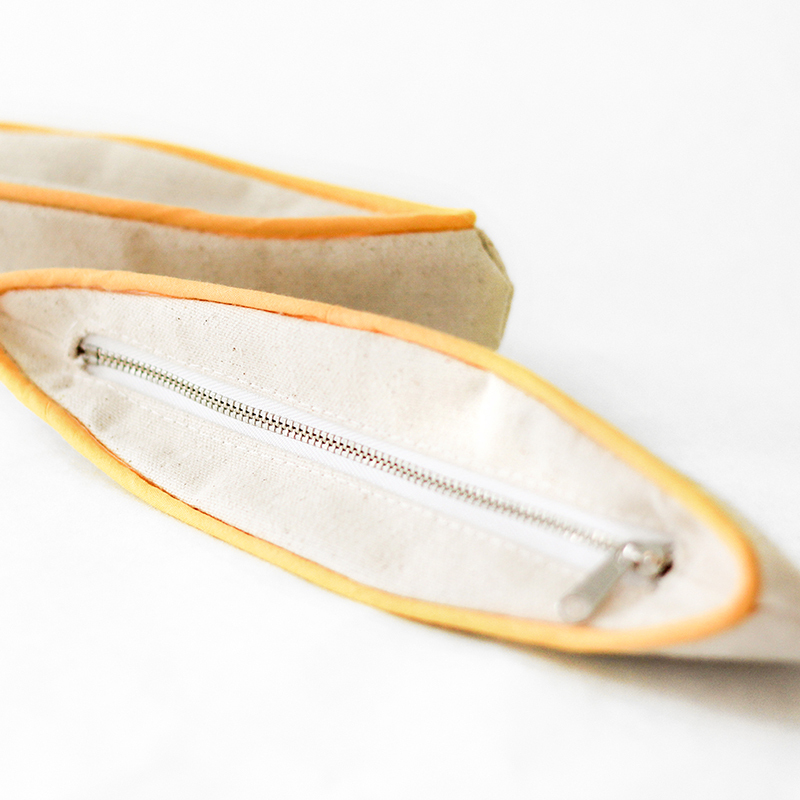 I actually thought this was such a cool idea I decided to be a backer for a small chunk of change. 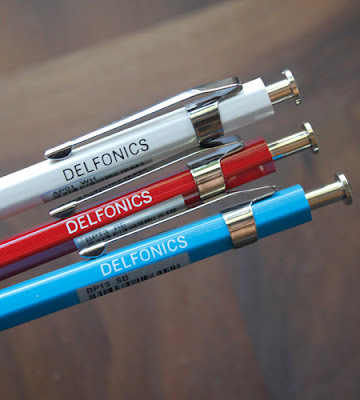 Why not support a small biz with a fresh idea which organizes our busy minds through handwriting? Especially when their mission statement reads “We want to bring back a time when innovation mattered, when playfulness was encouraged, and creativity was celebrated.” Creative juices, people. That’s what I’m talking about! Now go teach your child some old-fashioned moves. Have you ever written down all the thoughts which come in and out of your mind at one, focused time? I’m speaking of a train of thought and not simply the day-to-day facts and details but a more free-form way of writing. This concept was a little foreign to me. Over my 30+ years of journal writing, my deep emotions came out much more in my younger years when I felt no boundaries or social politeness around my writing. I still feel expressive when I write these days but it’s more about what my mind is thinking vs. feeling. Which is was why I was thrilled last March to attend my first writing class. Instructor Teri Blair led the small group and comfortably directed us to a writing practice somewhat free-form in style but with very specific directions taken from Writing Down the Bones by Natalie Goldberg; 1. Keep your hand moving, 2. Don’t cross out (edit as you write), 3. Don’t worry about spelling, punctuation and grammar, 4. Lose control, 5. Don’t think. Don’t get logical, and 6. Go for the jugular (don’t push away anything scary which comes up in your writing). It took the entire first class to let go. Pausing and reflecting are common themes in my current writing practice, but not in this class. In short, after the three classes I had a (surprising) new confidence and trust in my writing. It made me want to write less about the present but even more about the past, recalling images and experiences. As a writer I hope to write more in the undirected, present moment while embracing my whole life. Uh, that’s a mouthful. Will keep you posted on how that all goes! For you Twin Citians, Teri Blair is offering this class once again. Details for the Heat of the Summer Writing Practice: Four-week writing practice and meditation class taught in the tradition of Natalie Goldberg’s Writing Down the Bones. All levels welcome-including beginners! Call or email for additional information and to register: 612-729-9555 or teriwrites@yahoo.com. Teri has studied writing with author Natalie Goldberg for eight years, four of those spent as Natalie’s assistant. She has published several essays and poems, was awarded a grant to study at the Vermont Studio Center, and led a three-year poetry and meditation group in the Powderhorn neighborhood. Believe me, Teri is awesome. Documenting the wandering mind isn’t just for adults. And now is the perfect time to direct those creative little minds! Activities in the summer be it camps, swim team, or family road trips, hold some of the best memories for me. Now that I am a mom, I see how plain-old down time with only your imagination is just as important in the warmer months when more time is at hand. 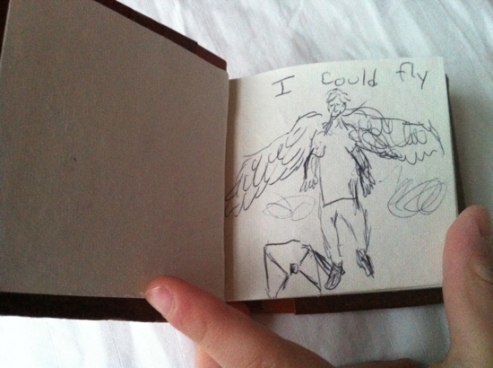 This idea from Mom Filter was a simple one, a dream journal for your kids. Summer provides more moments to dream, both day and night, and remember all that your mind creates on its own. Grab a small notebook the next time you walk into a drug store or Target and surprise your child with one of the greatest gifts you could give them…their mind.